Erup Cetin is in court in Izmir alongside his son Recep Cetin in Izmir. 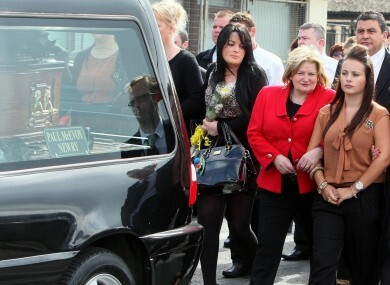 Shannon Graham at the funeral of her mother Marion Graham in Newry, Co Down on August 26, 2011. THE TRIAL OF the father and son accused of murdering two women from Co Down in the Turkish holiday resort of Kusadasi two years is drawing to a close. Heard by four judges, the men’s verdicts are expected later today, according to RTÉ News. Erup Cetin is in court in Izmir alongside his son Recep Cetin, believed to be aged around 23. Both are charged with the murder of friends Marion Graham and Kathy Dinsmore in August 2011. Recep has admitted stabbing the women, but claimed his father had nothing to do with it. However, lawyers for the victims’ families said DNA traces found at the scene where their bodies were recovered showed “two distinct DNA profiles” of men who were genetically related. Recep Cetin, who had been dating Marion Graham’s teenage daughter at the time of the murder, had claimed to be 17 years old and was originally being housed in a juvenile detention facility until bone marrow tests determined his actual age. The victims, who were both 53, had been on holiday in the resort of Kusadasi. Email “Verdict due in father and son's trial accused of stabbing two Newry women ”. Feedback on “Verdict due in father and son's trial accused of stabbing two Newry women ”.